If this Rocket Beer Bottle Opener Vintage Space Ship Antique Cast Iron is as cool looking in real life as its descriptive name would lead one to believe, then for $16.49 it seems like a great deal. I mean, just look at all those words. Really, what else do you need? Besides, the 6-pack, of course. 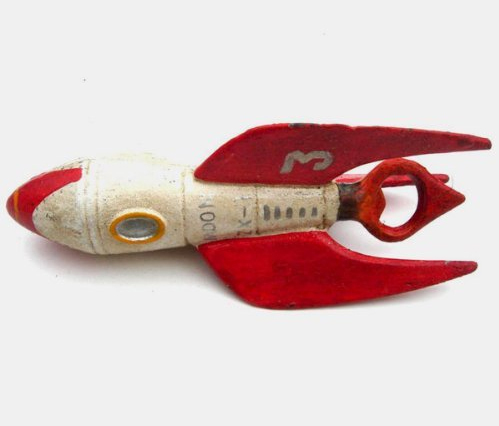 Rocket Bottle Opener Vintage Space Ship Antique Cast Iron is a great cast iron reproduction bottle opener shaped like a space-craft from the earliest days of space travel. Rocket Bottle Opener is hand-painted anqique white with red and yellow accents, and a redish orange flame cap remover. This large retro bottle opener stands 6.5″ tall and has the designation Z X-1 on the fuselage as well as the word MOON and the number 3 on one of the tail fins. Spaceship Bottle Opener makes a great gift for space-enthusiasts, amatuer rocketeers, and anyone else who wants to relive the first days of US space travel.